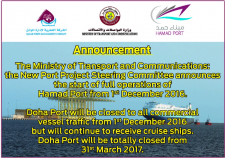 Qatar’s new Hamad Port will officially take charge of commercial shipments entering and leaving the country as from 01-12-2016, when it becomes fully operational, the Qatar government announced. By the end of this week, all container ships will go to the QR27 billion port in Umm Al-Houl near Mesaieed, as operations at Doha Port wind down. The old port near the Museum of Islamic Art will be closed to all commercial ships from then.